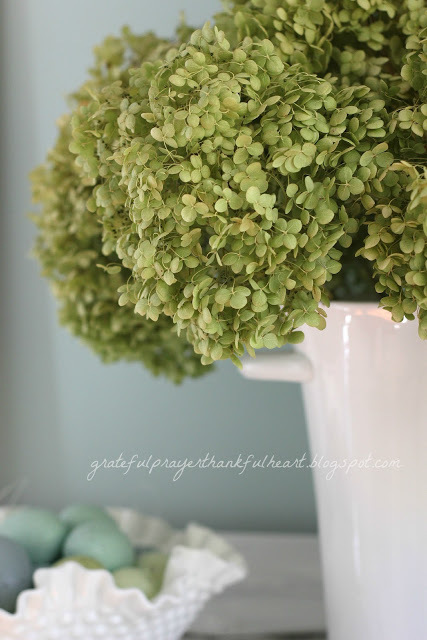 This is the color of our dining room and it is my favorite in the whole house. I remember having many paint chips taped to the wall for days viewing them in the various light throughout the day. 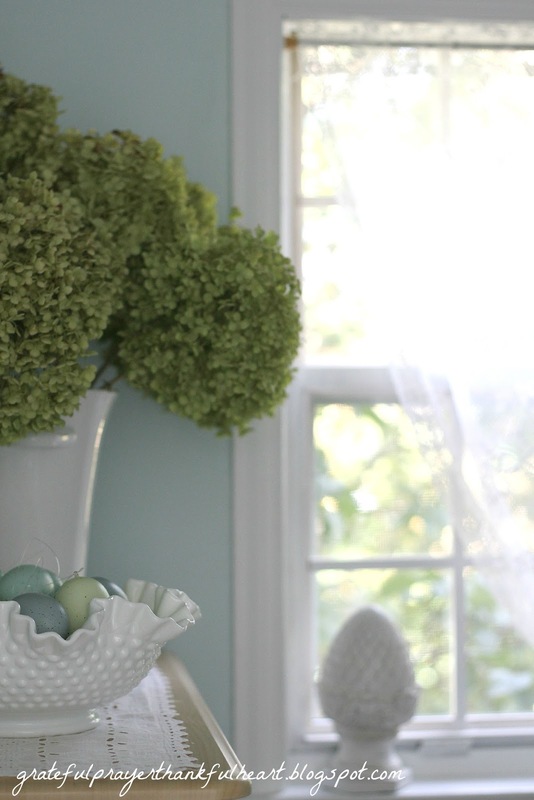 I settled on Aqua Frost (from Valspar) and have not grown tired of it since 2007. 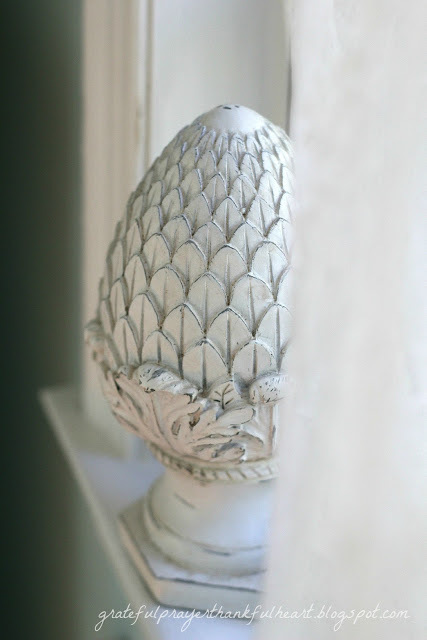 I had some leftover paint and used it in the powder room. I needed an additional quart and just squeaked it using every drop in the can. 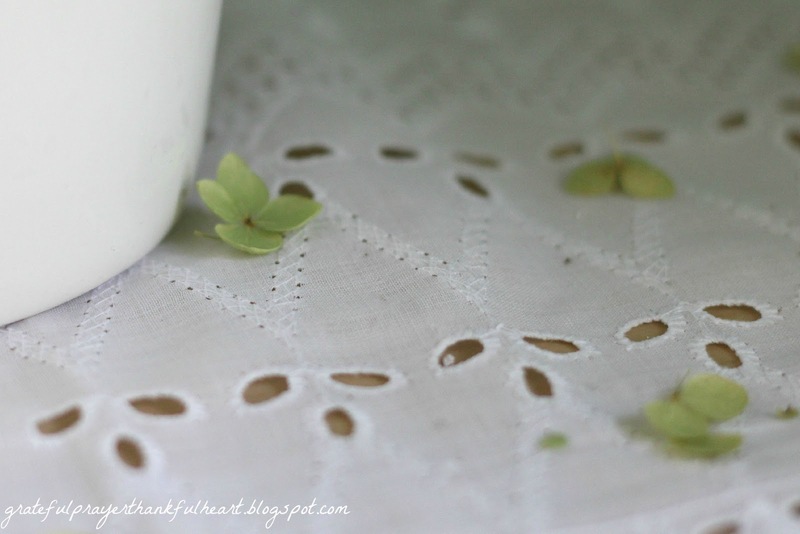 A simple lace panel for a curtain. A coat of spray paint on a mirror that was originally gold. The towel bar removed from the main bathroom that wasn’t needed there any longer. 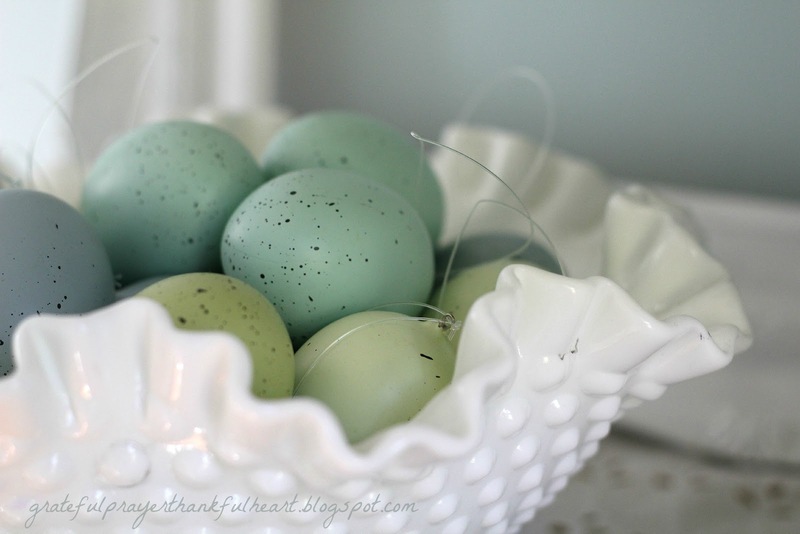 Eggs that usually sit on the dining room table each Easter. 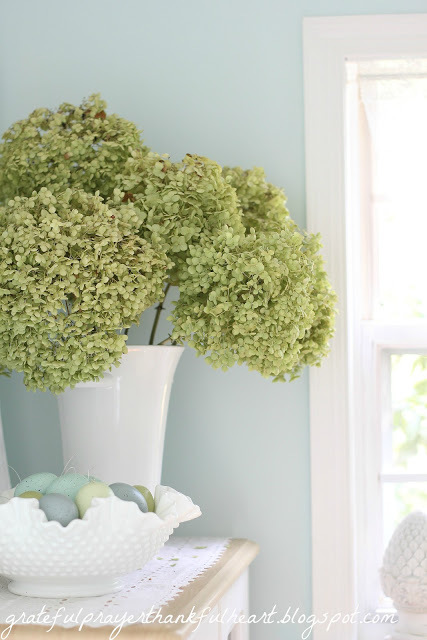 A white vase from the family room filled with giant blooms in a lovely, faded chartreuse . A decorative piece from the fireplace mantle. 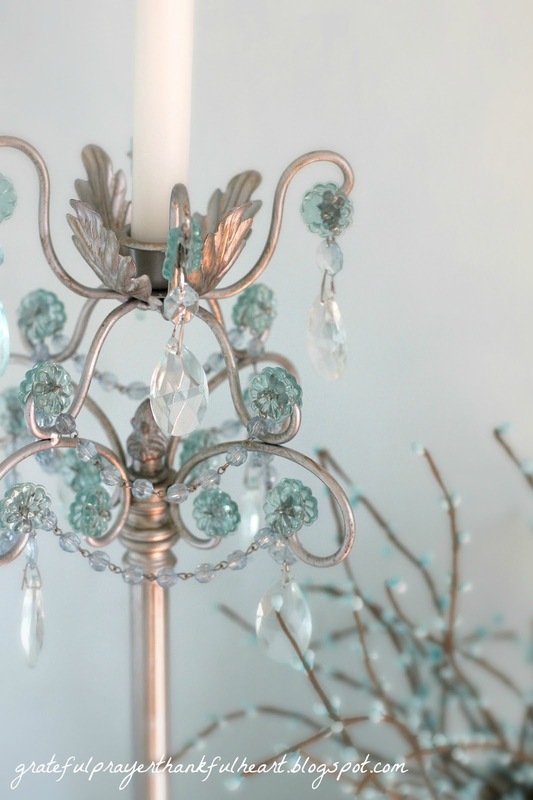 A sparkly candle stick from the dining room side buffet. 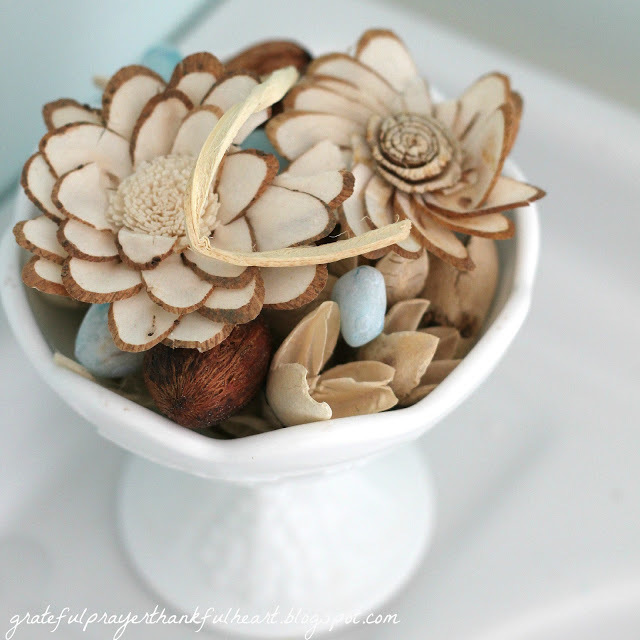 Potpourri ~ a birthday gift from a friend a few years ago and still fragrant. Tea pot doing double-duty and some berries stolen from a foyer arrangement. Warm sunshine on a finished project. If I had the privilege of going into that room, I know that I would not want to come out. You sure did a beautiful job, so soothing and peaceful, with all of your creative touches. Thank you for sharing it all with us. I really like the wall paint color. Your powder room is just lovely! No wonder you like that paint color–it's beautiful. You've done a great job of making this room special by shopping your house! I love the color of your bathroom I would not grow tired of it either. I bet it looks so pretty in your dinning room. All the crisp white really brightens up the room. I have enjoyed my visit with you today and look forward to reading more of your posts. Beautiful bathroom. Love that calm blue! Great accents throughout. Beautiful wall color! 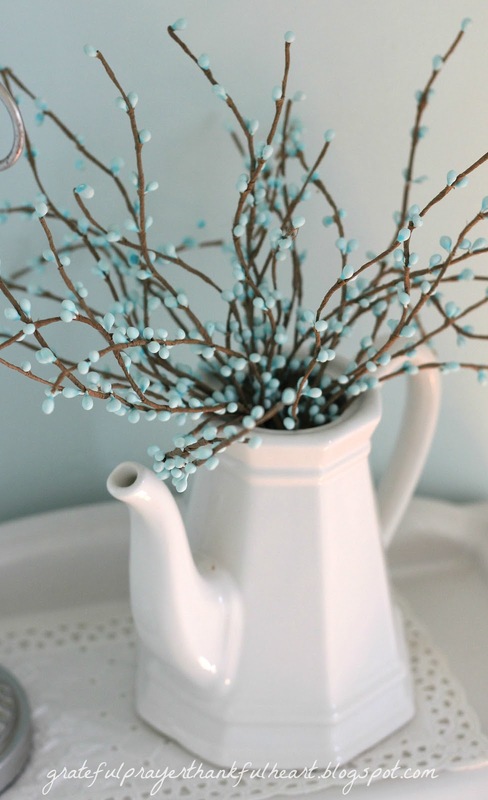 Lovely accessories and perfect touches in your bathroom. Your images are wonderful. Love your whites. Visiting from Brenda's. In one word – GORGEOUS! good morning. happened to come across ur blog while googling images for 2 Chronicles 7:14..i used the pic of the falgs and this verse from a blog u wrote on July 4th..i was wondering if that was ok..loved it, uploaded it as my cover pic on facebook and then thought-oh i should ask..wondering if you minded?thank u! Such a cool, calming color. Thank you for your sweet comment …I appreciate it. Such a beautiful bathroom. I love the soft colors in the room. Beautiful color and details, and I love how airy and full of light it is! You have a talent for decorating! I love the light and airy look of this powder room. The white curtains remind me of a summer bungalow; love them. The color is amazing! Beautiful paint color. No wonder you've never tired of it! I'm so glad that I'm following you! I LOVE your powder room! 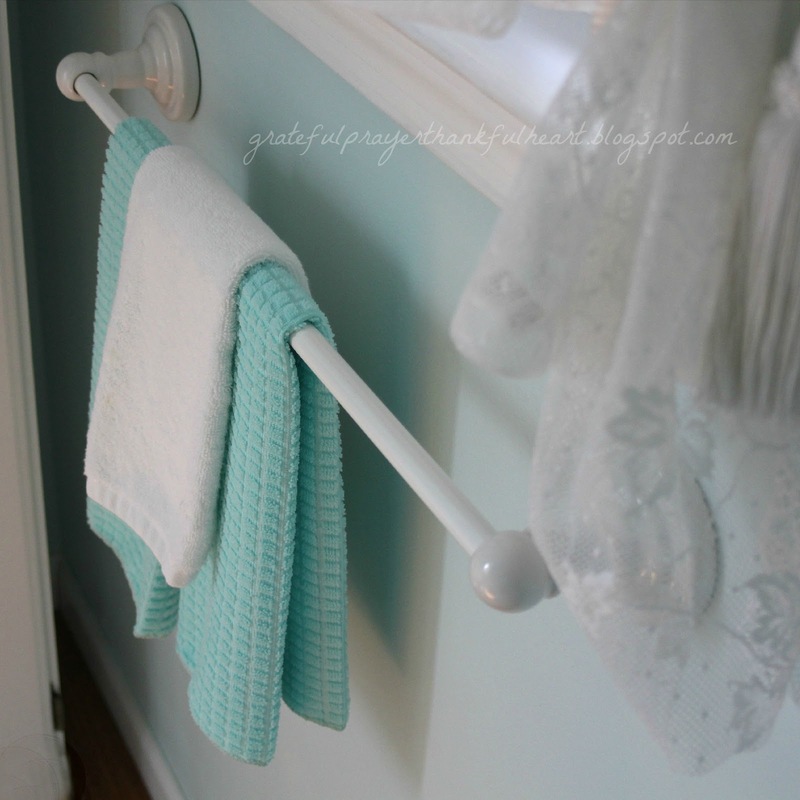 Your powder room is so lovely! 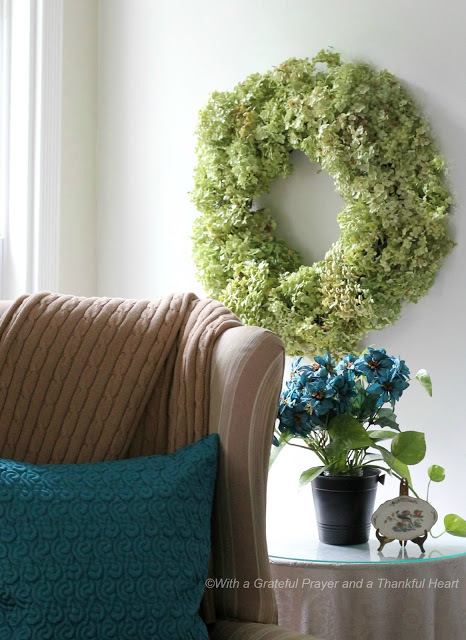 I really like the way you reuse your decorative items from other rooms in a thrifty yet elegant manner. I am your newest follower! Thanks for sharing and inspiring! It all looks so fresh and neat and clean. Wish I could say my own home looked that way, but alas…I can't seem to get anything done these days!!! 🙁 I'm in HOPE's that when hubby goes back to work (prayers, please) I can find the time to clean house!!! 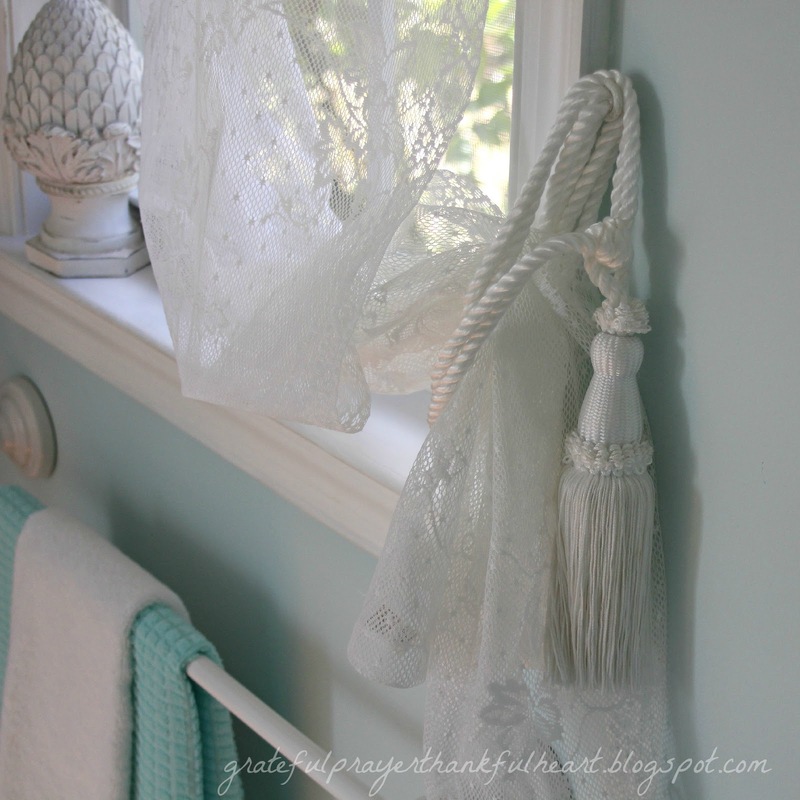 I absolutely love the colors in your powder room! So beautiful and everything is placed perfectly! Hi Lorraine, I'm a new follower! 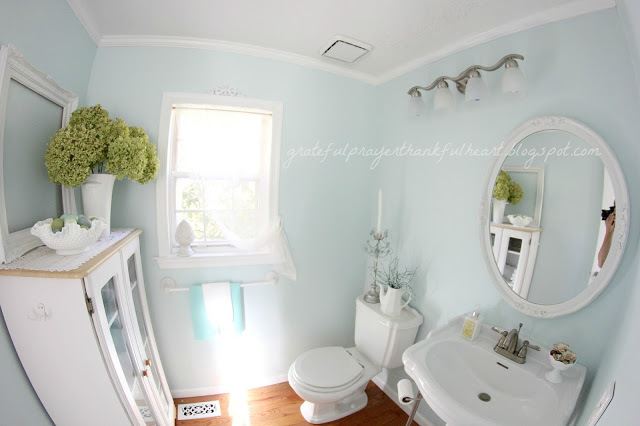 I have a white on white with sage touches powder room, bringing this aqua in would also be perfect. I love the Candlewick? footed bowl! It so reminds me of my dear grandmother, who I will see again someday. What a beautiful room you have created! Lovely! I love that you were able to create a new look using objects found around your home and from your garden. Your attention to the details of shape, texture and color really help to enhance the beautiful wall color that you selected. I love the colors and the little touches throughout the room. Just beautiful. I love the color and the hydrangeas look great against it! So peaceful and calming.Love your bath too! Every single detail is gorgeous! I wish I had a window in my little powder. It's perfect. Very beautiful! it all goes together so perfectly. So pretty! Love your color choices, and photos. It's very pretty and your photos are lovely. I especially like the milk glass bowl. Oh my I just love it. soo soft and fresh! Looks gorgeous and I too love that color. I tried so hard to use it in the guest bath I'm redoing but it just wasn't right with the countertop my son put in. 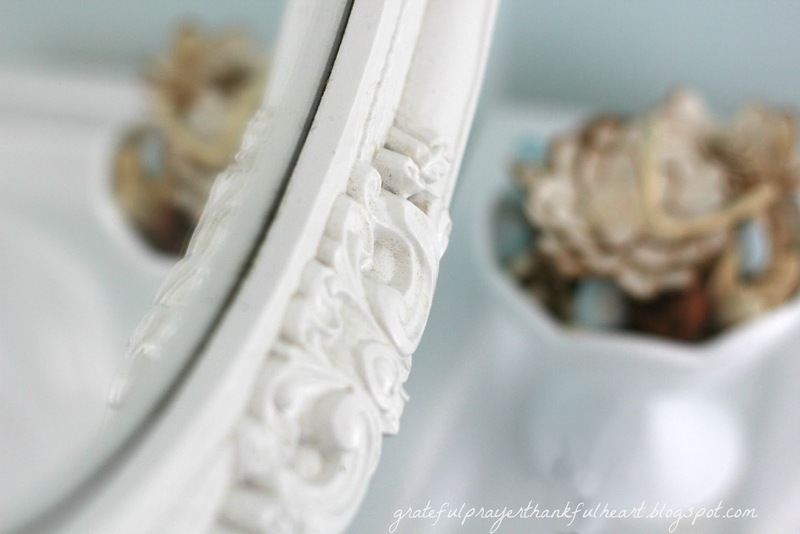 I love the mirror and have been contemplating doing the same thing with an old gold framed mirror. I like the idea better than going to buy a new one. It all looks great! Beautiful. The different items have come together in a lovely manner. I have already said "graceful living". Love it!I love how your gold mirror is white now..I love updating old to new!! Just beautiful! Love the color and all your pretty accessories. Perfectly beautiful!! I love your color, Aqua Frost. It is telling that you have not tired of it, but love it more over the years. That says that it is "right." You have so artfully gathered from the rest of your house to make a lovely room. Gorgeous! it is such a fresh, crisp clean color, I really like it. Absolutely love it. Every small detail. I am gonna share this link. Lorraine, you have a beautiful taste! It's such a pretty room Lorraine…so fresh and bright! 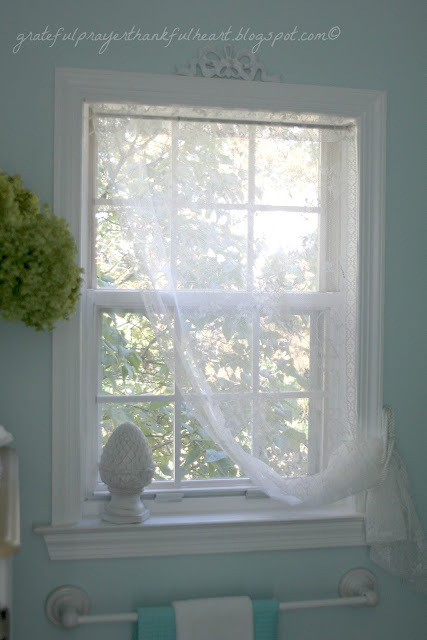 Love the lacy curtain on the window. colorado and find it restful. Gorgeous! I love the color…its so soothing. visiting over from organize and decorate everything link party. LOVE the wall colour and all your delicate details! Love the blue and all the textured details!